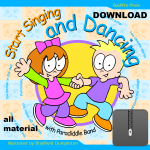 15 fun and lively songs that encourage children to sing and dance! This resource includes lyrics and great illustrations, vocal performances and video demonstrations. There are three ways to purchase Start Singing and Dancing: as a physical book + CD, a download of the entire resource, or you can buy and download individual songs. The choice is yours!